If you’re looking for a romantic vacation or honeymoon, perhaps you should consider visiting San Francisco, California. This great city offers a little something for everyone in addition to some very romantic destinations. There have even been songs about how romantic San Francisco is. Tony Bennett left his heart there if memory serves and who could resist a view of the Golden Gate Bridge when there’s a full moon? 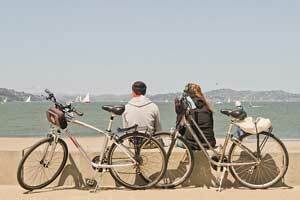 San Francisco has been designated one of the most romantic cities in America. Don’t you think it’s time your found out why? It could have something to do with the climate, the beautiful Golden Gate Bridge, the many beaches around that are great for taking long walks at sunset or the many parks in the area where romantic couples can walk together, hike, bike, and simply enjoy being together. In addition to activities such as this, there are other ways in which to enjoy the great outdoors of San Francisco as a couple. You could take a sunset cruise in the San Francisco bay is you want to make a very romantic night of it. If you want to have a truly romantic experience you could schedule a couples massage at one of the many day spas in the area. This is an experience that neither of you would be likely to forget anytime soon. While there are spas across the country, there are quite possibly as many spas as there are Starbuck’s in the city of San Francisco so you can be a lot more selective in the one you choose. Another romantic thing to do while vacationing in San Francisco is to tour the various vineyards in the area. While San Francisco is not literally part of wine country, it is only a stone’s throw away from some of the most famous vineyards in America. It would be a literal sin to come so close and not tour these American legacies. Check with the wineries you want to visit ahead of time, as some require appointments for tours. Rest assured that visiting the beautiful countryside and enjoying the tasting of various wines will make for quite the romantic outing. Be sure to taste responsibly. Take your loved one to the restaurant and bar at the top of the Hyatt Regency Hotel. While the dining experience can be pricey, the spectacular view will take some of the sting out of the meal. Besides is there really a price that is too high to pay for romance? If either of you have the slightest interest in art, San Francisco is full of museums and galleries that should appeal to your artistic nature and provide plenty of topics for discussion. Even if you aren’t a fan of traditional art, you may actually surprise yourself by liking the art you find in this diverse city. Any trip to San Francisco would have to be determined to be a romantic dud if it didn’t include a trip to either Fisherman’s Wharf, China Town, or Little Italy. These areas provide great food, beautiful and interesting sites, as well as a taste of cultural diversity that is hard to find in this day and age. It would be like traveling to New Orleans and not visiting the French Quarter. I whole-hardheartedly recommend devoting one entire day of your trip to one of these places if not each of them. Fisherman’s Wharf is by far my favorite to visit for the sights and sounds, but both China Town and Little Italy have great things to offer as well. Plus, the food is too good to pass on without at least giving it serious thought. Romance is a state of mind; it’s just much easier to get to that mental place in a city like San Francisco. Take a trip with your beloved and see what all the talk is about.